Finnish, Turkish or infrared saunas have many favourable effects on the body and offer numerous health benefits. However, sauna rooms suffer from a chronic shortage of negative ions. Many people experience a type of exhaustion that cannot solely be attributed to the change in temperature. For this reason we have developed special sauna ionizer, which is capable of standing high temperatures and moisture. You will notice a major improvement in how you feel if you leave an air ioniser running in the sauna for about two hours before taking your sauna, or even turning it on when you start, so that it can clean the air, dramatically improving your well-being and strengthening your immune system. plastic housing, silicon connecting cable, light indicator, printed circuit, isolation transformer, safety fuse, carbon brush. 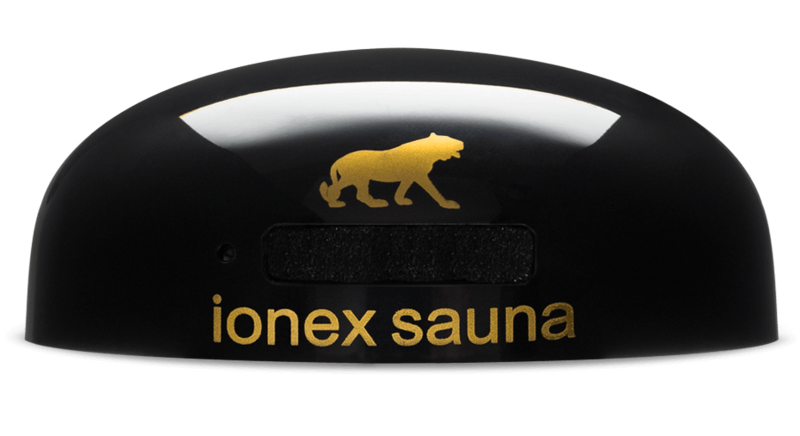 Ionex Sauna ionizer emits negative ions, purifying the air, creating a beneficial atmosphere and has a beneficial effect on health. It ensures healthy and comfortable living and is completely quiet and non-disturbing. Negative ions enable better feeling, as they reduce the stress hormone levels and improve the body’s natural defense and vitality. They affect people in an invigorating and relaxing way. They have a beneficial effect on the body as they reduce all the respiratory, bronchial and asthmatic problems, allergies and the consequences of stress. They also regulate blood pressure and the heartbeat and improve concentration in addition to being beneficial to well-being and allowing a better sleep. Feedback from customers confirms the excellence and efficiency of the appliance. Do I need Sauna Ionizer? In Japan, a study was conducted about the physical effects of negative air ions on humans in an experimental sauna room equipped with an ionizer. The surface temperatures of the foreheads, hands, and legs in the sauna with negative ions were significantly higher than those in the sauna without ions. The pulse rates and sweat produced in the sauna with ions were significantly higher than those in the sauna without ions. The results suggest that negative ions may amplify the effects on humans of the sauna. These results show that negative ions can increase the effects of sauna. It means we can achieve comparable results even at lower temperatures in a sauna. This is a good news for people who cannot stand high temperatures, yet still want to achieve the cleaning and therapeutic effects of sauna. 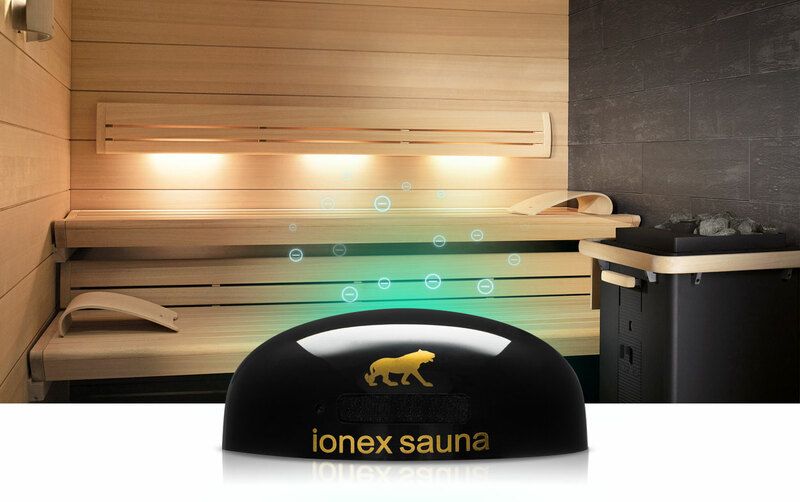 When installed in a sauna, Ionex Sauna ionizer should be placed on the highest position (like a shelf) and connected to the control panel. It is also recommended to place the ionizers in the resting rooms to completely clean the air, to remove bacteria, viruses, germs, odours, dust and other pollution from the air and enrich the rooms with negative ions. 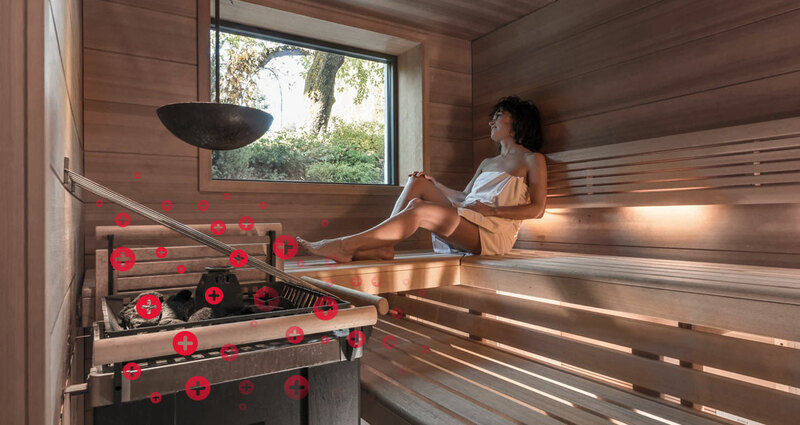 Negative ions are known to reduce stress hormone, people have a relaxed, calm, satisfied and pleasant feeling, so an ionizer can increase the relaxing effects that a sauna has on people.